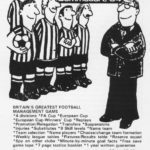 A short entry for what could have been actually released, but under a different name. 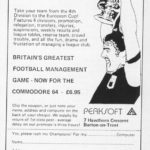 Champions was a football management game that was advertised by Peaksoft in 1984. However the C64 edition of the game never made it out, only the Dragon 32 edition. UPDATE – Confirmed as released on the C64 as “The Boss”. Thanks Martin! Good to get confirmation 🙂 Updated entry.